In this book, management consultant Verne Harnish, the CEO of Gazelles, and Fortune's editors provide the background stories behind the greatest business decisions of all time. In this fully original book, you'll get a glimpse into the thought processes leading up to these groundbreaking moments and will learn how the decisions have shaped the thinking of today's top leaders. 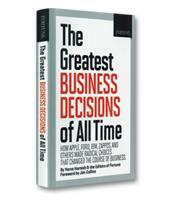 Given the thousands of business decisions made every day by company executives and business owners around the world, selecting the 18 greatest business decisions of all time is no small feat. In The Greatest Business Decisions of All Time, nine Fortune magazine editors have compiled such a list, including modern and historic decisions from companies around the globe. Verne Harnish, the Fortune magazine contributor who launched the idea of the book and whose succinct summaries precede the case study on every decision, explains: "In the end, the 18 management decisions that made our final list stood out from others because they were counterintuitive — they went against the grain of popular practice." For example, Harnish continues, "What executive in his right mind would give his employees time to daydream — but that’s exactly what 3M CEO William McKnight did in 1948." Many business book readers will be familiar with McKnight’s decision to give employees a certain percentage of free time to work on the project of their own choosing. Other familiar stories include Johnson & Johnson’s decision in 1982 to take action in the wake of the Tylenol poisonings that caused the deaths of seven people in the Chicago area; Jack Welch’s revitalization of GE’s corporate university at Crotonville, NY; and Nordstrom’s focus on boundaryless customer service. In the knowledgeable hands of the Fortune editors, the short chapters of even these well-known cases make for interesting reading, thanks to unexpected details. For example, Geoff Colvin, the Fortune senior editor-at-large who writes the 3M chapter, debunks the idea that the Post-it note came entirely from the company’s free-time endeavor. It was 3M’s culture that was truly responsible for one of its most famous products. Some of the most inspirational examples are in the book’s less-familiar stories. How the company that invented liquid soap was able to fend off the behemoths of the industry is a noteworthy anecdote. The brainchild of Robert Taylor, the CEO of a small Minnesota company called Minnetonka Corp., liquid soap was the kind of small-enterprise innovation that is usually immediately copied by the corporate giants on the block. And, indeed, when Taylor’s liquid soap started flying off the shelves, Unilever, Colgate and Procter & Gamble started testing their own versions. Taylor, however, devised a little-known strategy to keep control of the market: He found a way to block his giant competitors from accessing the plastic pumps used in the liquid soap bottles. At the time, only one company made the pumps. Taylor met with the CEO of the company and took the financial risk of ordering 100 million pumps, effectively ensuring a monopoly of the pumps for a full year. The strategy, which had never been attempted by such a small company, worked. By the time his competitors had access to the pumps, Taylor’s Softsoap brand was well established. 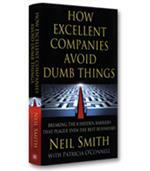 The 18 great management decisions in this book are not ranked in any particular order. They stand as inspirational examples of the power of bucking conventional wisdom and making bold and innovative decisions.